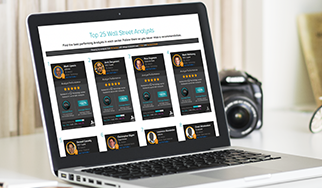 TipRanks utilizes its technological capabilities to track four different types of Financial Experts; including the ‘gurus’ of the financial world, hedge fund managers. These managers invest billions of dollars using various investment strategies and risk management techniques. With TipRanks, users can decide which hedge funds are worth following by tracking the quarterly activity of top-performing fund managers. TipRanks measures the performance of hedge funds based on information submitted to the SEC. Any hedge fund managing over $100M is required to submit a 13F form to the SEC which lists their current holdings at the end of each fiscal quarter. TipRanks uses this information to determine how each hedge fund performed in comparison to other hedge funds and to the S&P 500. The top hedge funds are determined by those that generate the highest return based on their stock portfolio over the last 3 years. 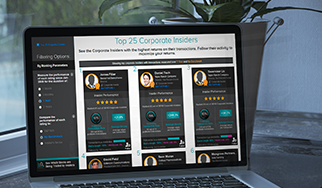 On the Top 25 Hedge Fund Manager page, you will discover the identity of the top 25 hedge fund managers. You will find a snapshot of the hedge fund manager, their portfolio value (total assets under management) and average return over the last 3 years. You can even see the proportional distribution between stocks bought and stocks sold. Follow the hedge fund manager by clicking the small head button in the right-hand corner. Want to find out more? Click ‘see full profile’ for a complete portfolio breakdown of stocks bought and sold as well as a graph showing the fund’s measured performance over time. 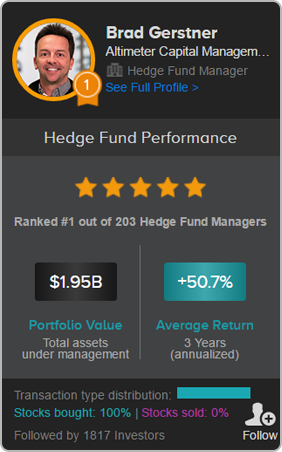 For example, in the screenshot above you can see that this number #1 hedge fund manager, Brad Gerstner, has (at the time of writing) an average return of 50.7% over the last three years (annualized) and a portfolio value of $1.95 billion. Have a question about the TipRanks Top 25 Hedge Funds?